Fifteen thousand years ago, the Missoula Ice Dam gave way and 500 cubic miles of water flooded the area of northern Montana and western Washington. The alluvial flood left behind fossils and rock specimens that have fascinated modern-day archeologists and geologists. But the flood also left glacial-till soil conditions with dinosaur size boulders that confound modern-day underground-utility contractors. The Water Service Department of Spokane, Washington, under the direction of City Engineer John Bjork, underwent a major water transmission line replacement this past year. Thousands of feet of old 36- and 48-inch lines were replaced because the old riveted steel pipe from the turn of the century had begun to deteriorate. According to Bjork, the intent of the huge project was to totally replace the old lines with new ductile iron pipe in situ. "With age, some rivets were starting to come out of the old pipe. Given the high pressure of these transmission lines, there was a fear that if one ruptured, there would be damage to the other lines. There are four important transmission lines near the two wells that they draw from, and at 160 plus psi pressure, there would be a real problem if one broke." The project began in late spring with the majority of the footage excavated and replaced with open cutting. In the plans for the project, some of the main roads through the eastern part of the city (where the north-south transmission lines ran) would be open cut. "The plan was designed for the majority of the work to be done in the spring and fall because of the summer's high demand for water," described Bjork. "That way we could take these two wells out of service and still have six wells to handle the city's needs. Our plan was for all of the work between intersecting roads to be done prior to a road crossing. When it came time to cross a road, we would open cut the road on a Sunday when traffic would be at its lightest." The Burlington Northern railroad has a number of tracks that run through the eastern part of Spokane. Neither the general contractor nor the city planners could move the rail lines that intersected the intended route of the water transmission lines or cut through them. Gonzales Boring and Tunneling, Inc., of North Plains, Oregon, was contracted to execute six bores under different track locations. Under the direction of founder Jim Gonzales, this specialty boring and tunneling contractor has worked in 11 western states and Hawaii for the past 15 years. In this time period, the company has run up against the toughest soil conditions imaginable, but none of its experience could have prepared it for the rocky conditions underneath these rail tracks. "There was a total of six crossings on this job. The glacial till we bored and tunneled under was the roughest I have even seen," explained project manager Tom Malcolm. "The ground was filled with what I call river run, a porous sandy mix of cobble and boulders. What we didn't expect to hit were boulders the size of Montana!" Malcolm and his crew auger-bored the first of two casings under the three-track rail line. On this 200-foot bore, positioned six feet away from what was to be the second bore, the auger boring system successfully installed a 48-inch-diameter casing with 5-1/2 feet of cover from the surface to the bottom of the pipe. During the first of these two bores, Malcolm and his crew feared losing railbed support using their auger boring machine. "A couple of times the loose glacial-till material fell down as the head of the auger boring machine advanced forward," stated Malcolm. "Many times on this first bore, the rocks were too large to move through the auger flighting, so we had to go in and physically pull them out. We went into the pipe to pull out this spoil every time we had road-bed material come down. That's why we decided to go with the 23-inch HammerHead Mole pneumatic tool on the second bore to pipe-ram the 54-inch-diameter casing with its 0.72-inch thick walls." With a pneumatic pipe ramming-tool, the fear of creating voids is eliminated since there is a solid steel pipe in the earth at all times with the spoil filling up inside the casing. Railroads are increasingly taking note of pipe ramming as an excavation tool when casings need to cross their lines. With such a tool, they do not have to worry about interruption of service, voids during construction or post-project settlement. To accomplish the pipe-ramming operation, the crew prepared a 40-foot by 12-foot launch pit according to the engineer's plans of a 0.25% grade. The plans also called for the large casing to reach 180 feet to the other side, which had the three-rail track line with only six inches of fall. The launch site used auger boring tracks to set the casings on and maintain the prescribed grade when pushed through the soil. 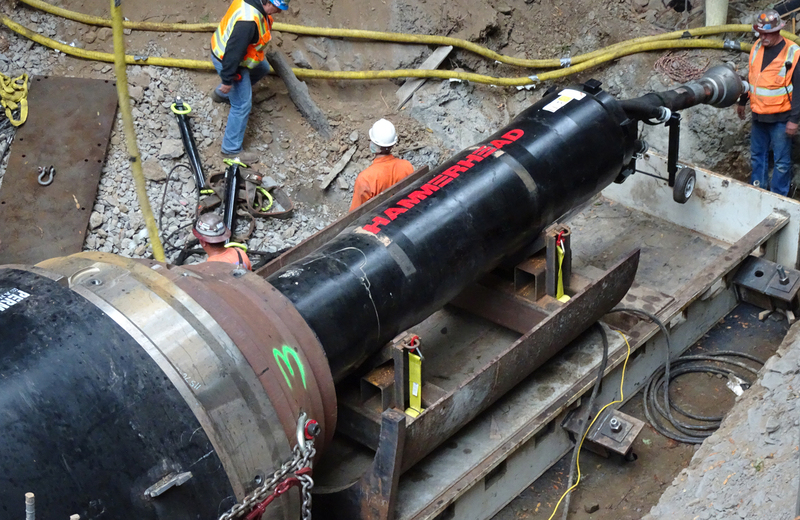 "Because of our experience with auger boring and pipe ramming with the 16-inch diameter HammerHead pneumatic tool, we decided to use both technologies," explained Malcolm. "The heavy-hitting 23-inch-diameter pneumatic tool would ram the casing. Then every 20 feet or so, we planned to use the auger flighting to clean out the spoil to lessen the drag and weight from the spoil accumulating inside the pipe." No lubrication system was used on this pipe-ramming job, even though bentonite and water mix had been used for the auger boring done previously on this site. According to Malcolm, "When we used bentonite in these soil conditions before, we poured in what I thought were tons of it and all it did was dissipate into the porous, sandy conditions because of the boulders in the soil. The stiff clay on this bore that we were trying to soften up was not the problem; it was the huge boulders we ran into." Progress in the rocky conditions was slower than expected. After pushing in every 20 feet of casing in the early going, the crew used the auger boring machine with its auger flights to move spoil out of the casing. But more than once, progress was halted and winch systems were used to move huge boulders from the inside of the casing. "The four-inch-thick steering head we had attached to the lead pipe eventually fractured some of the boulders that had significantly slowed our progress," stated Malcolm. "We were sure that we had run up against boulders that were wider than the 54-inch-diameter casing. More than once, we had rocks much larger than what the augers could pull out." Crew members used pneumatic air drills to puncture the rock inside the pipe and drill in eye bolts. Winch cables were then attached to the eye bolts, and a winch was used to haul out the fractured pieces. Considering its hardness, some crew members estimated the rock to be 30,000 psi granite. With only a couple of weeks off for the holidays, Gonzales Boring and Tunneling, Inc., kept at the nettlesome project until it reached the 180-foot mark of the pipe ram on the opposite side of the rail lines in early February. "This was a tough job, and we all wish we could have completed it earlier," said Tom Malcolm. "Pipe ramming with the 23-inch tool was probably the only way we could have got the job done at all."